An English Homestead: Bringing Up A Nation Of Mommas' Boys? I was reading a blog the other day that was about what they were calling the "snowflake generation" (If you follow my Facebook page you might have already seen the link). In short it's about some young adults that are still acting like children and the one wanting to be called "princess" as that's what her daddy called her! 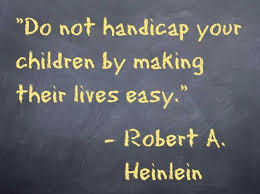 It really struck a cord with me and made me think that when some parents think they're helping their kids by making their lives easier, they are in fact making it harder in the long run. I can spot them a mile off with the age my children are now, I call them helicopter parents as they're constantly hovering around their children, making sure they're alright and not having any bumps or falls. At work today I heard a perfect example of the results of this type of parenting with the plasterer's apprentice at work. The day before he was off ill and got his mother to phone in sick for him. None of us could believe this and the plasterer even said to her that she doesn't work for him and next time only the lad is to ring in. Now he's only 16 so I guess you could let him off, but he's working on building sites with lots of men doing physical work and, I think, should act like a man as well. Hopefully it'll be a steep learning curve that he'll keep up with as he's a nice lad. The mother who thought she was helping him out only really gave a group of builders ammunition to take the micky out of him. What do you think? Is there a soft generation coming up into the world of work right now? Over here, I'd say it's the SECOND generation! Here in the States we seem to be raising a generation of children who believe they are entitled to rewards without working to earn them. Children, win or lose at sports, are given trophies just for showing up. Last summer my young grandson's baseball team came in second at their tournament. When he asked his coach where his trophy was, he was kindly informed that if he expected a trophy he and his team would have to work harder and perform better than the other teams. So they did. They worked and practiced and took home the first place trophy yesterday. I am grateful that his coach doesn't believe in unearned rewards. Too many young people think they are entitled to rewards for showing up. My grandson will do well. He knows if you want it, you need to work for it. Seems like you and his coach have got the right idea! i think that him having that attitude will help him understand what's to come in the future and everything has to be earned. I think you've summed it up pretty good there! Sadly two of my grandsons have helicopter parents, but Josh 10 is breaking free, with a bit of help from us. Children need to be able to work out risk of things, starting with small risk and building. I can hear them hovering from here! As others have noted, we in the states suffer from the 'special snowflake syndrome'. I had hoped such things weren't affecting you all as well. When I lived in the UK some five years ago, I still saw children walking/taking the bus to school (sans parents), so I figured British youth were not as corralled as ours have become. I've no idea what it's like over there but things are getting worse I think. The other day I found out that my eldest will have to wear gloves for Forest schools regardless of the weather. I said I'd like to sign a note to say that she can go without and they said I couldn't do that! I also said that I didn't want to raise a sissy and another parent said I couldn't say that about children! I said I'm a builder I could have said a lot worse! I think the problem is people's interpretation of health and safety regulations. Just as nobody said you have to wear goggles to play conkers, one headteacher famously decided that was what was needed. I have two friends who are Forest School leaders and I work in early years and I'm pretty sure there's nothing anywhere that says you have to wear gloves. I agree with you, it goes against the whole concept behind the Forest School movement- enjoy and engage with nature, take managed risks and learn by experience. WE have a terrible problem with this here in the States. Every moment of a child's life has to be supervised and filled with planned activities. Kids don't have ANY imagination or ability to "play" anymore. It's crazy. I sometimes feel guilty as I'm not playing with my children all the time but as I get on with jobs they get one with their own lives and games. I love it when I'm doing something and then just step back and watch them play in their own little worlds. Kev I am old school when it comes to parents playing with children. You have many duties but children should entertain themselves. But I do believe in reading to children. In my opinion we are into the second softer generation, or should that be one soft one and then an even softer one following on. Children have to left to be bored and THEN and only then do they get their imaginations into gear and find something to do for themselves. Gosh my two used to read a book and then go and act on what they had read, in the case of my eldest it was campfires and famous five escapades but at least we lived in a village where everyone knew him and he couldn't go too far. My younger son used to watch a snooker match on television and then go and replicate it on his little snooker table (with a running commentary) .... and this was when he was four years old. They were never wrapped in cotton wool or ferried here there and everywhere and they survived. I fear for our future if two many princesses and 'losing' trophy winners are in charge of the world. We need more children like yours that are having a proper childhood, but I think with a lot of their parents already having been brought up this way they have nothing but bad examples to look up to. Oh and more fool him, my eldest son married a 'princess', she even has 'Daddy's Girl' tattooed on her arm ... she got it done when she was 30!! I think I'd cut my daughters arm off if she ever did that! Along a similar vein I stumbled across this article the other day and I literally cried out YES!!! Sums up my generation and why we feel entitled and disappointed simultaneously! Loved that article and it explains it really well! My parents certainly did better than they thought they would! I think looking on it that way we've all had it easy as none of us have been hungry (yet). Yours does sound hard though! talking about the sense of entitlement I have a friend who spent 8 years traveling and working around Latin America, then came back and moaned he could buy a house and had a rubbish paid job! Drive me up the wall! I'm not too much older so I have to be careful people don't think that of me. I have acquired a hardworking group of friends over the years, many with their own sets of skills that compliment my own. I'll save that podcast for later, sounds interesting. My son is 15, he works on a farm. He works 7-12 and then 5-9 or so. It's hot here (90-100F). He is out in the fields weeding, planting seeds, and in a couple weeks, harvesting. If he's sick, he calls in. He likes his job, and is glad to have the opportunity to earn money. Unfortunately, we live in an area where "mommy and daddy" pay for everything. We told our kids that isn't us, you want a car, you save up and pay for one. Luckily, they are good with that. They even acknowledge that many of their peers are "special snowflakes"
Good that he understands! I remember being 16 and driving for my dad for the summer and I said that instead of having money as wages that year I'd rather he saved them all up and bought a car and put it on the road for me, he agreed straight away! Had one of them snowflakes visit us recently when a workmate I had not seen in 20 yrs showed up from Germany with his son in a surprise visit and I mistakenly invited them to stay over. Just about the most fragile and pussified little wallflower you could think of. Trouble was that he is 17 yrs old. The dam mobile phone was glued permanently to his hand. Would not get off it even at meal time. And his dad was not much better and absolutely facilitated this behavior. And all the kid would eat was chicken breast so meal times were awkward at best requiring special separate dishes for the "child". Completely socially atrophied. Sadly the best part of the visit was when they left. I dread to think what the next generation will be like. We are so totally fu---d.
That sounds bloody terrible. Some of our friends cook different meals for their children and ours always have two choices, take it or leave it. they normally take it, I think that because they're quite involved in what they eat we don't have too many eating troubles. I work in a Secondary School, be afraid, very afraid! Second generation snowflakes being enabled by first generation. You would not believe the amount of parents still coming in almost daily with forgotten homework, clothes for after school visits to friends - MOBILE PHONES - my pet peeve and no end of forgotten this that and the other. How will they learn? I can honestly say that there is no way my mum would have brought in my homework if I'd forgotten it! But I doubt I would have done it anyway! Each generation says the next has it easier then they did, and this in a sense is true with technology and increase of living standards(eg fridges the norm and so on). But aren't the parents of this soft generation not the product of their parents? Society (government/school) making life too easy and the expectation of entitlement OMG. My 3 year olds preschool class ran a race and all won the race....WTF no they didn't so i was the awful parent telling my daughter she was awesome running but did not win. Childhood should be magical but should also include getting bored, less toys(stuff), more time outside and being told no. You could go on and on. I think it's a lack of respect, earning what you've got and more importantly not getting everything you want. (basically not being a spolied sh*t). I remember breaking something, told to put it in the bin and there would not be a replacement. However my parents who did this with me will happily replace my daughters broken toys. You can imagine my response errrrr NO! I have to admit to not telling my four and two year old that they lost the race just yet, but once they move on to infant school I think things will different, at the momment it's not really a race anyway! Still if they're as sporting as my wife or me they'll have to get used to not being first! I make sure mine have plenty of time to get bored that's for sure! They are forever creating words to play in and showing us things they've made. Like you I try to get them to be useful as well. Last night my middle child helped me fix her broken wooden toy in the workshop before going to help me get veg for tea, she was so proud of herself. This is a tough one. My parents took care of me until I left home at 17. After that, I was on my own. As a result, while I never suffered any real privation, I have some unpleasant memories. So now that my kids are out and earning a living, my wife and I sometimes do little things to help smooth their path. We have helped them with money from time to time. We gave them a very good SUV when they left home, and we try to make sure they have what they need. My kids don't ask for anything, and they work like dogs. They have never been arrested, never messed with drugs, never had any problems like that at all. So my wife and I feel very fortunate. Neither of my kids are wimps. We are very proud of them. But I know it's difficult to hold that line and not be overly protective. If for no other reason that you won't be around forever and they have to be able to function on their own. Don;t get me wrong here, I'm not saying not to help your children! My own parents help me out all the time, in fact I'm very hopeful that dad will come over this weekend and help me dig the patio! I'd be lost without my folks! Oh I could rant about this for pages, but I won't, I'll just agree with all the previous comments! Just wanted to add though, that when me and my sisters were living at home once we started working we were expected to give Mum money out of our wages for our 'keep'. Even from my Saturday job at 13, which paid me £3.17 I had to handover £1 of it. My own daughters were horrified when I carried on this practice, none of their school friends had to pay their way at home. If fact some of them had Saturday jobs and also got pocket money or a clothes allowance. So it was difficult for me to enforce regularly, and they whined about it everytime (as you can imagine). Did anyone else have to pay their parents 'keep' or was it just mine? Keep up the good work Kev, I love it that your little ones are getting the skills and life you are giving them! I have to admit that I only paid keep once I was working full time but I did work on the farm to help dad a lot so I guess that was my keep paid! When my children were young I practiced what my GP used to call "A studied neglect" of my children and the many foster children that arrived at our door. This "technique" hasn't changed for my grandchildren. I think it is important that we foster a strong work ethic too. Come the day (the one we are prepping for Kev?) I don't want snowflakes in my team!